“First, we live in His house. As members of the Catholic Church, we live in the house which Christ promised to build—as a wise man does—upon the rock (cf. Mt. 16:17–19; 7:24–27). ‘Christ was faithful over God’s house as a son. And we are His house if we hold fast our confidence and pride in hope’ (Heb. 3:6). So then you are no longer strangers and sojourners, but you are fellow citizens with the saints and members of the household of God, built upon the foundation of the apostles and prophets, Christ Jesus Himself being the cornerstone (Eph. 2:19–20). “Second, we are called by His name. In Baptism, we are marked for life in the name of the Father, the Son, and the Holy Spirit (Mt. 28:18–20). We ‘were sealed with the promised Holy Spirit, who is the guarantee of our inheritance until we acquire possession of it’ (Eph. 1:13–14). Our family unity is thus based upon the unity of the Spirit in the bond of peace. There is one body and one Spirit, just as you were called to the one hope that belongs to your call, one Lord, one faith, one baptism, one God and Father of us all (Eph. 4:3–6). “Third, we sit at His table. We ‘partake of the table of the Lord’ (1 Cor. 10:21)—as God’s children—in the Eucharist, which Jesus instituted in the presence of His disciples ‘as they were at table eating’ (Mk. 14:18). “Fourth, we share His Flesh and Blood. In Holy Communion, we come to share in Christ’s Flesh and Blood, according to His command: ‘Truly, truly I say to you, unless you eat the Flesh of the Son of Man and drink His Blood, you have no life in you; he who eats my Flesh and drinks my Blood has eternal life, and I will raise him up at the last day. For my Flesh is food indeed, and my Blood is drink indeed. He who eats my Flesh and drinks my Blood abides in me, and I in him’ (Jn. 6:53–56). “Fifth, His bride is our mother. The Church is Christ’s bride, the heavenly Jerusalem (cf. Eph. 5:21–32; Rev. 21:1–10, 22–23), and also our mother. ‘But the Jerusalem above is free, and she is our mother’ (Gal. 4:26). Even more, Jesus gave us His mother, the Virgin Mary, to be our mother: When Jesus saw his mother, and the disciple whom he loved standing near, he said to his mother, ‘Woman, behold, your son!’ Then he said to the disciple, ‘Behold, your mother!’ And from that hour the disciple took her to his own home (Jn. 19:26–27). “Sixth, we celebrate as a family. We gather together as the children of God to celebrate, most especially in the Eucharistic banquet: ‘Christ, our paschal lamb, has been sacrificed. Let us, therefore, celebrate the festival’ (1 Cor. 5:7–8). For this reason, God calls us to ‘be filled with the Spirit, addressing one another in psalms and hymns and spiritual songs, singing and making melody to the Lord with all your heart’ (Eph. 5:18–19). As Catholics, we celebrate different feast days to honor our Blessed Mother and our spiritual brothers and sisters, the saints—not only for their holy lives, but also their glorious deaths, which marked their own joyous homecoming. “Seventh, we receive instruction and discipline from Him. Our Heavenly Father even uses our labors and sufferings to instruct and discipline us. ‘My son, do not regard lightly the discipline of the Lord, nor lose courage when you are punished by Him. For the Lord disciplines him whom he loves, and chastises every son whom He receives. It is for discipline that you have to endure. God is treating you as sons; for what son is there whom his father does not discipline? …for they disciplined us for a short time at their pleasure, but He disciplines us for our good, that we may share His holiness’ (Heb. 12:5–7, 10). 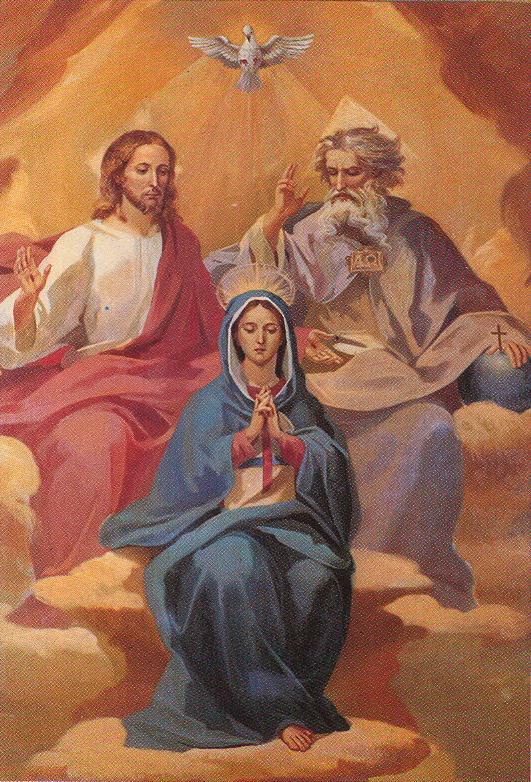 One of the reasons why the family has always been under attack is because it is an icon of the Trinity. This is precisely why the Church is a great defender of the family. If you destroy the family, you destroy the best understanding we have of God.